Lexington Avenue at East 116th Street is a crowded shopping corner of mom and pop and local chain shops—and the site of a weathered old advertisement for Bloomingdale’s flagship store 56 blocks south. The vintage typeface looks nothing like the one Bloomingdale’s uses on their ads today. Does anyone know when it might date to? This entry was posted on March 29, 2010 at 1:14 am and is filed under Fashion and shopping, Random signage, Upper Manhattan. You can follow any responses to this entry through the RSS 2.0 feed. You can leave a response, or trackback from your own site. 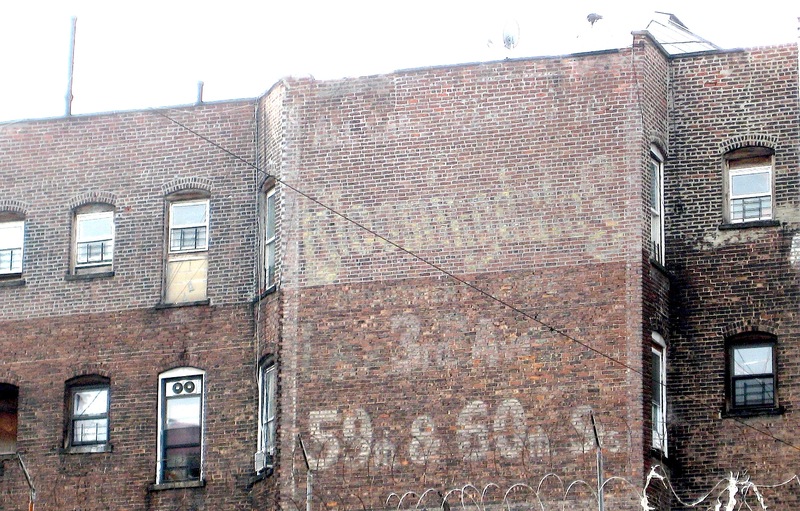 FORGOTTEN NY has several images of old Bloomingdale ads (on buildings) from different periods. Several of them have the exact same script as the one you photographed, except that one slants to the left, while another one, on another building, in the same font, slants to the right. Here’s an image of the famous Bloomingdale ad on a real umbrella like the one you can see a little of on one of the Forgotten NY ads. The umbrella is hard to read, but it’s unmistakeably the Bloomingdale ad. (You have to click to enlarge the image and then you still have to look hard). Postcard is dated 1919. Rockaway Beach scene. On an umbrella, in lower right area of the postcard, there is a repeated ad: “All cars stop at Bloomingdale’s.” (Cars meaning trains, trolleys.) Bloomingdale’s appears to be rendered in a script very similar to the one on the building. The “B” at the beginning and the tall “S” at the end are about the same. But on the umbrella, the script doesn’t seem to slant leftward as it does on the building. The following would be a real prize, as it dates from the late 1880s — earlier than all those early 20th century ads on the buildings. : A003. Advertising Item: Very early, rare Bloomingdales ad card. Front is full color die-cut artist’s pallet, including thumb hole & “globs” of different colors of paint, plus image of a ballerina dancing. 4-1/8″ long card stock. Back of “pallet” is a b&w image of store, “Bloomingdale Brothers Dry Goods Hosiery”. “Take 3rd Ave Cars to BLOOMINGDALE’s 3rd Ave cor 56 St.” printed on three sides around the image. Would guess this to be late 1800s piece. Regularly priced at $30.00, Now on sale for $21.00. Wouldn’t you know, it’s the only item in this catalogue for which, “Sorry, No Picture Available.” And it’s too pricey (for me) to buy for the sake of curiosity. Thanks for all the research Josie–it’s much older than I thought! Good old leaded paint, lasts forever. Today’s lead free paint wouldn’t last a decade. Progress, bah humbug. They say lead is bad for the children, give me a break. I are lots of lead paint chips as a kid and a turned out fin and not dum.